After an 11-day vacation my husband and I arrived back home the evening of August 17th and I am still working on getting back into the swing of things. Our trip was within our own state, but to an area that was very different from where we live. We began with a two-night stay in Boyne Falls, Michigan for a memorial service. 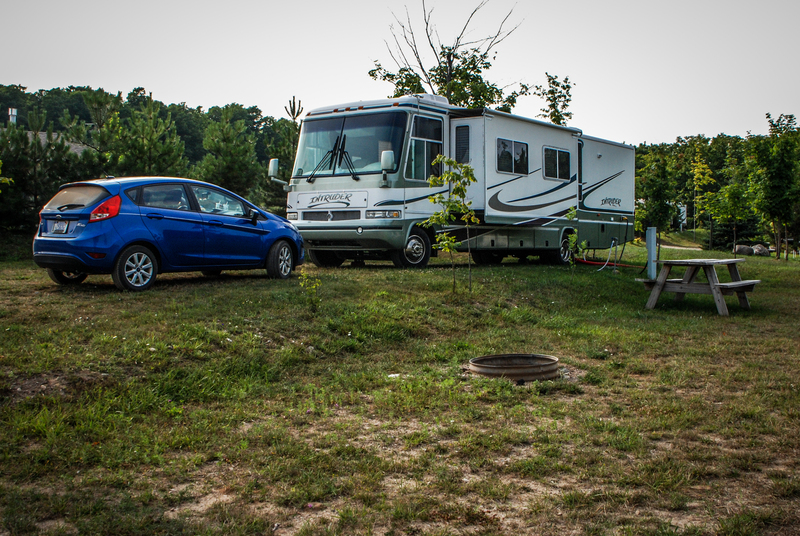 We have a motor home and had booked into a campground there that is located on a country road. What we found, luckily after we had left the motor home at the camp and were driving only our car, is that the GPS does not distinguish between good country roads and seasonal, 2-track roads. We also discovered that it is possible for a GPS to get confused because after taking us down an assortment of roads it took us back down the same roads we had just come from. So much for a GPS being able to navigate from Boyne Falls to Boyne City — it couldn’t even find our campground! Mackinac Bridge during Orange Barrel Season. Photo by Grace Grogan. 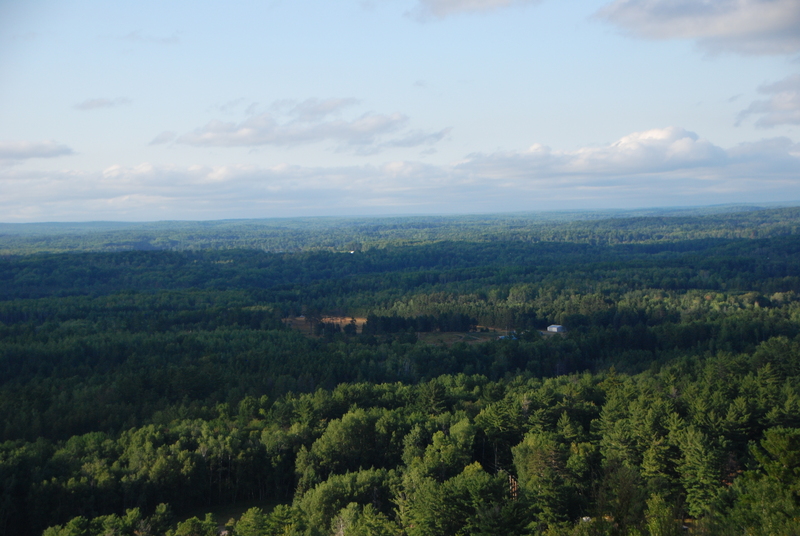 Our next destination was Iron Mountain, located in Michigan’s upper peninsula. 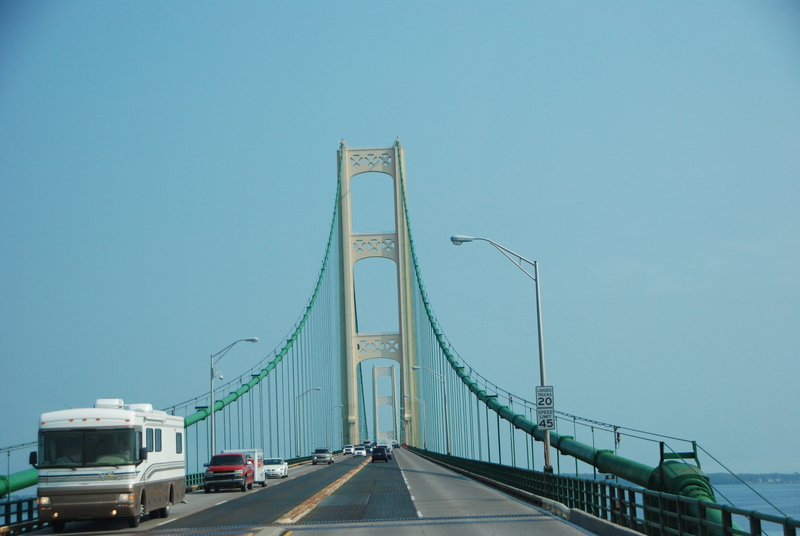 Our drive from Boyne Falls to Iron Mountain was uneventful, unless you count orange barrels on the Mackinac Bridge an event. Of course all Michiganders know that summer is “orange barrel season” and why should a bridge be any different? What we found during our stay in the UP is that although we were in the same state, the environment and way of life is very different. Iron Mountain is on the south side of the UP very close to Wisconsin and about midway across. It is home to one of the world’s largest ski jumps, and if you drive to the war memorial there it will take you up to where the jump is located for a beautiful view of the area. 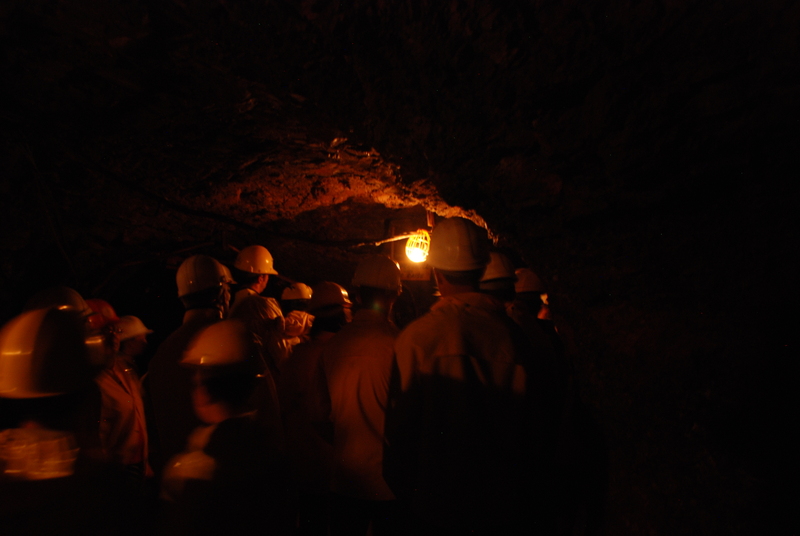 We enjoyed a tour of the Iron Mine in Vulcan, where they take you approximately 425 feet below the earth’s surface into the mine. 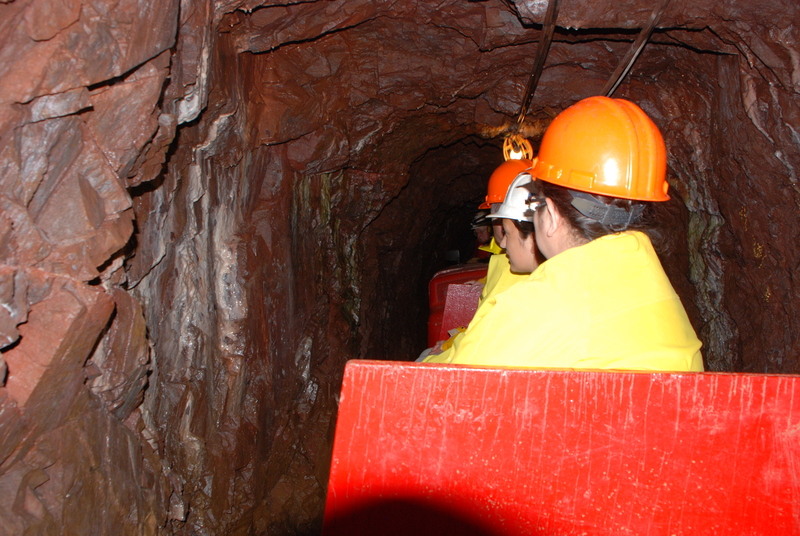 Mining has not been conducted there for years but it is interesting to learn the conditions under which they worked and the tools used to drill in the mine. 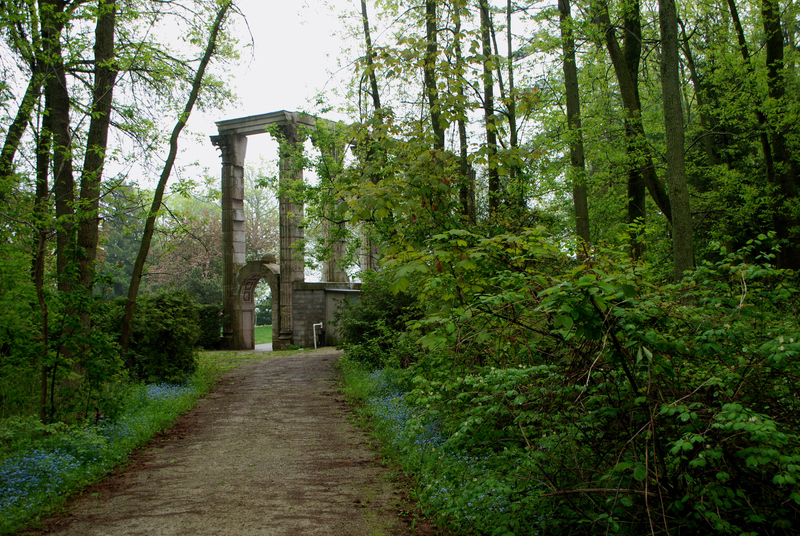 Our main objective of the trip was to photograph waterfalls, lighthouses and nature. We were disappointed that although we passed several Moose Crossing signs the moose were not being cooperative and we never saw one. We did see several deer, wild turkeys, and what we believe were a couple coyotes. We found that while some waterfalls are well known and have a lot of visitors, others are secluded, hard to find, and require driving down narrow county dirt roads that are only slightly wider than a car width and you will only find the waterfall if you are lucky because they are not well marked. Driving down county roads can be interesting. We came across lumbering areas where we stopped to take photographs, and discovered that semi-trucks coming at you on those narrow dirt roads drive at a pretty good rate of speed. Don’t forget to roll up your window because you will be engulfed in a smog of dirt after they pass. 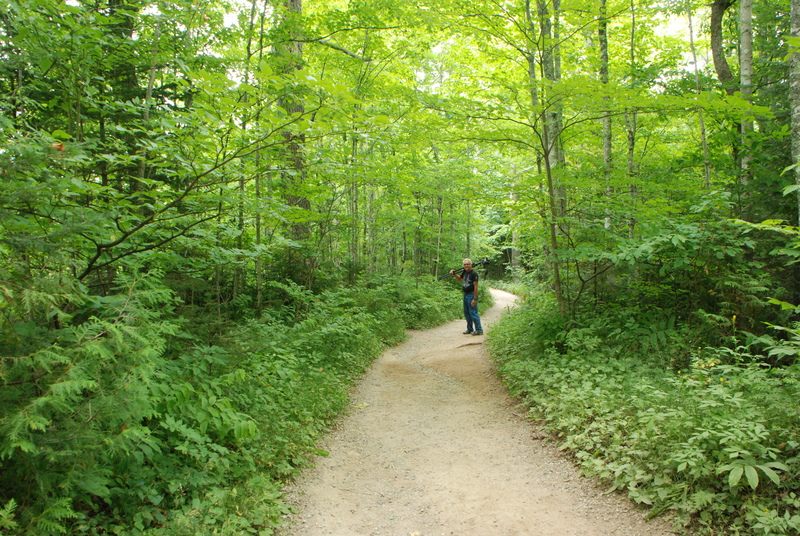 Much of the UP is National Forest, so you are driving those narrow dirt roads with huge trees on both sides. We commented on how beautiful they must be during the fall color season. Part of the UP is Eastern Time and the other portion is Central Time, and as we drove to our various locations we were constantly bouncing from one time zone to the other. The solution, leave your wrist watch on Eastern, set the microwave on Central, and your cell phone will automatically change for whatever time zone you are in. Although this did not have a massive impact on our vacation plans, you do have to keep that in mind when considering the hours a place is open or when you make reservations. 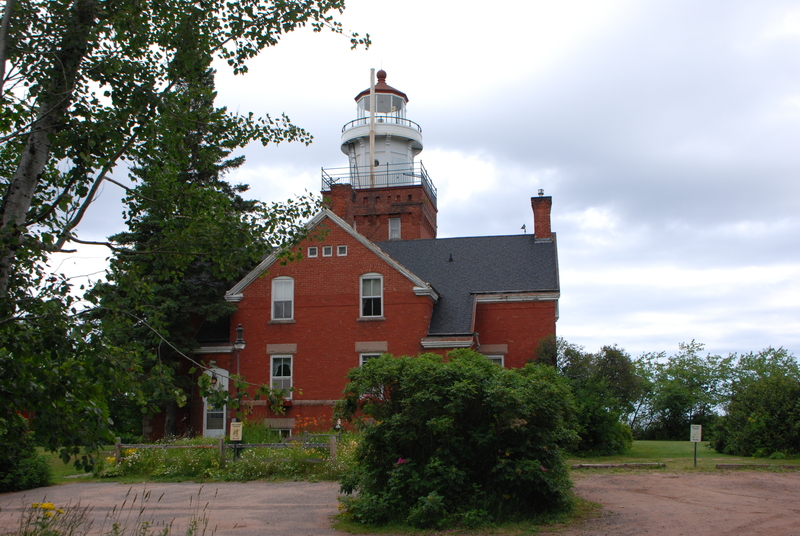 Two of the lighthouses we visited are private and can only be seen by tour. We luckily stumbled upon them at the correct time to take part in the tours and learn about life at those locations. The job of lighthouse keeper was a lonely existence for both the keeper and his family, as they were often in places that were located out and away from other civilization. Climbing a lighthouse that is part of a home is an easier, shorter climb for a great view. By the time you begin your climb up the spiral staircase to the lantern room you are already on the second floor of the home and only have a bit farther to go. Iron Mountain View from War Memorial. Photo by Grace Grogan. I have given you a few details on our trip, but the question you may have is why did I say it is “Same But Different?” Because it is. I live in Michigan’s lower peninsula in the thumb just south of Port Huron. When you cross from the “mitten” into the UP in some ways you take a step back in time and into a small town existence. A “big city” has a Walmart and a KMart, and some fast food establishments, there aren’t many big cities in the UP, Iron Mountain, Marquette, Munising and St. Ignace are those that come to mind immediately. The rest of the UP has small towns, no fast food, and the towns have long stretches of roadway between them. Of course you can always find a restaurant serving pasties wherever you travel, something you will not find in lower Michigan. A pastie is meat and potato with maybe a couple other veggies in a crust. They were carried by miners down into the mines to eat for their lunches. We traveled Highway 2 several times and it is a long road of forest and very few cars. 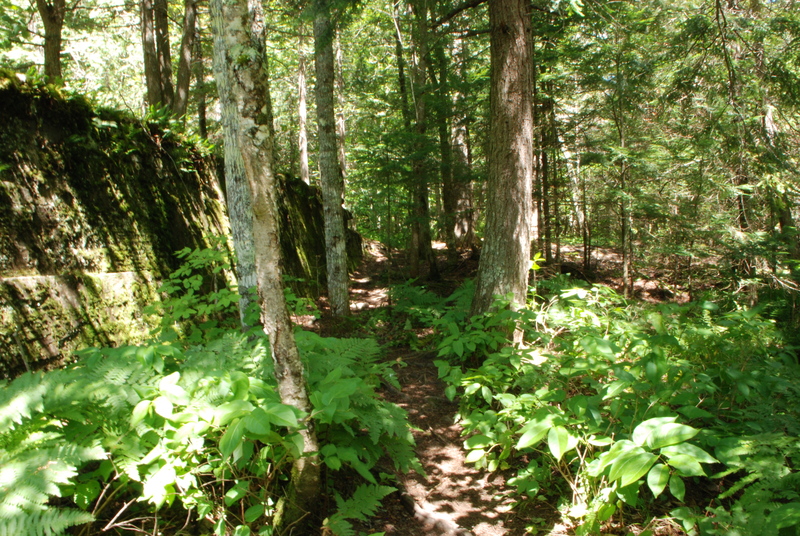 You spend a lot of time driving in the Ottawa National Forest or the Hiawatha National Forest. The UP does not have “rest stops” like we are familiar with where you have a nice modern building, vending machines and bathrooms. When you travel in the upper peninsula there are Roadside Parks with picnic tables and the bathroom facilities are actually outhouse toilets. Did you want to wash your hands? If fussy about that you better carry some hand sanitizer. We noted that most vehicles on the road are clean without any with damage from accidents or rust. When living in an area where you have to drive for miles between cities without any other cars, homes or businesses between having a well maintained vehicle is a must. While there are miles and miles of desolate area there is no litter. Here in the lower peninsula you find litter everywhere, but not in the UP. We never once saw so much as a gum wrapper on the ground – clean and natural as it should be. Uppers take pride in their environment and it shows. We will definitely go back to the UP for another vacation. It was relaxing, has great photo ops, nature, and requires a lot more time to explore than we allowed. 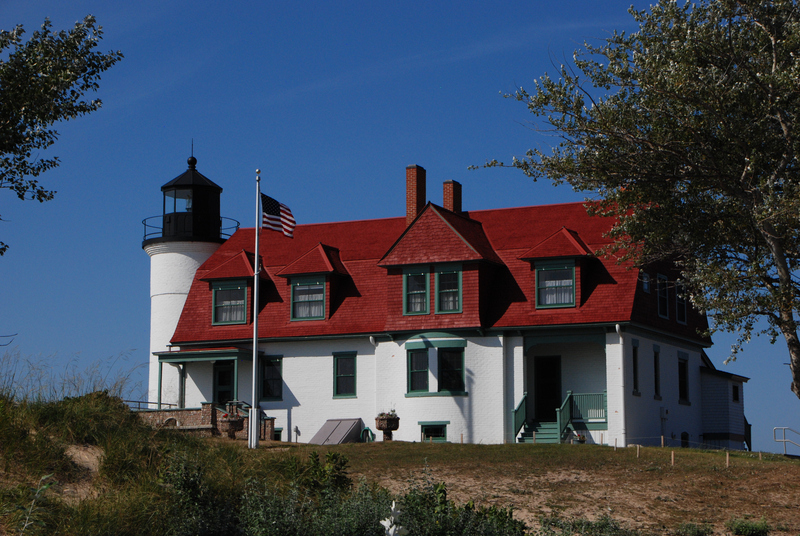 If you want to go somewhere that is the “Same But Different” take a trip to Michigan’s Upper Peninsula. Whenever my husband and I plan a vacation one of the first things I do after we book a reservation is start reading about things to see and do in the area. I lay out a day-by-day itinerary so we know each day where we are going and as a result we see and do lots of things in the course of a week. Over the years I have had friends and co-workers laugh at my intense planning, and was recently told that we are on vacation and need to relax. Of course those same people tend to say when we get back “wow, you guys see a lot when you go somewhere.” Absolutely, the planning insures that. What type of vacationer are you? Do you go somewhere, lay around the pool or at the beach reading, or do you fill your days taking in the sights and sounds of the area you are visiting? For years we stayed in hotels when we traveled, but about three years ago we purchased a motor home and now stay at campgrounds, using the RV as our own mobile hotel room. We aren’t “campers” though. We get up in the morning, have breakfast and then head out for the day to see the sights and take pictures. We usually get back to the campground and fix a late dinner and then set up our laptops to download and view the photos taken that day. We were recently informed that we are missing the fun of hanging out at the campgrounds all day and then around a campfire socializing. We aren’t unfriendly, we chat with our neighboring campers, especially those that are there for the same length of time we are. People have different views on relaxing and enjoying a vacation. Ron and I are not they type of people to hand around a campground all day. To us travel is for the purpose of seeing and doing as many things in the area we are visiting as possible. The planning of our daily itinerary guarantees that will happen. Our vacation this summer is to the Upper Peninsula of Michigan. We are photographers, and the possibilities are endless. 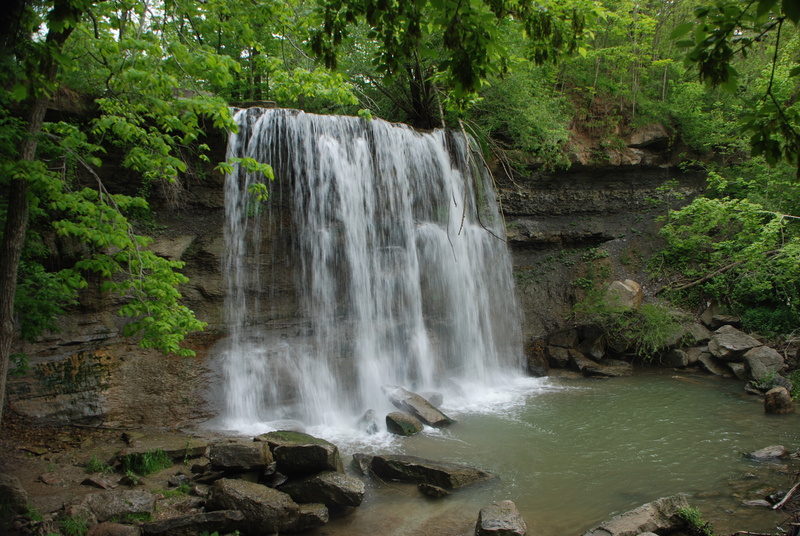 The UP has 300+ waterfalls, 40 lighthouses and numerous nature preserves, historical sites and more. So far I have five different counties on our itinerary to do in that many days. While we won’t come close to seeing and doing all the UP has to offer, we will definitely see and do a large number of things and will each take several thousand photographs in the nine days we are there (seven days if you disregard the day we travel up and the day we travel home). 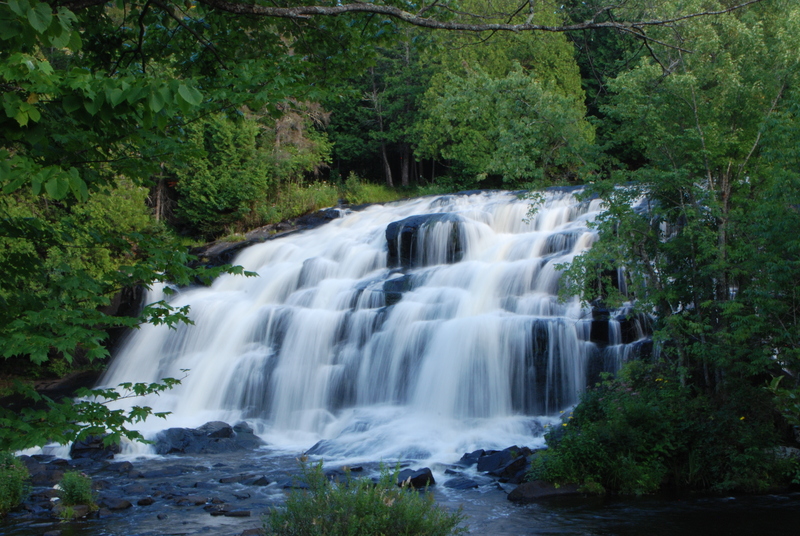 Have you traveled to Michigan’s Upper Peninsula and have a suggested “must see” location? Please share what it is. What type of vacationer are you , itinerary planner or sit by the pool and relax? Why do you feel that is the best way to vacation?